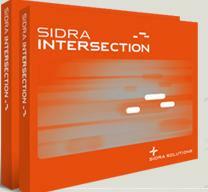 We are excited to announce the ground-breaking new version of our flagship software – SIDRA INTERSECTION 6. This is a major new release that will provide our customers with a unique lane-based network modelling capability in addition to single intersection modelling with significant new capabilities such as modelling of movement classes (buses, bicycles, large trucks, trams, and so on). which serves and contributes to our profession worldwide. Origin-Destination Movements as a basis of all data and modelling. Major data structure and user interface changes have been implemented as a result. Unique lane-based micro-analytical model for network analysis. All intersection types allowed (signals, roundabouts, sign control). Easy to CONFIGURE using SIDRA INTERSECTION Sites. Easy to compare a large number of scenarios quickly. Backward spread of congestion: capacity reduction at upstream lanes blocked by downstream lane queues. Capacity constraint: oversaturated upstream lanes reduce demand volumes for downstream movements. Lane Movements: blockage of upstream lanes depends on lane choices of movements from approach lanes to exit lanes. Upstream and downstream lane flows and mid-block lane changes on an approach to determine platooning. Light Vehicles, Heavy Vehicles, Buses, Bicycles, Large Trucks, Trams and two User Classes are allowed with different vehicle characteristics. Each Movement Class can be subject to special treatment such as allocation to different lanes, lane segments and signal phases. This is the basis of all data and modelling (replacing the use of aggregate Left - Through - Right turn designations in some areas). This provides improved handling of movements at intersections with diagonal legs and U turns generally. Lane disciplines (exclusive and shared lane arrangements) and all movement data are specified and all lane flowcalculations, capacity and performance estimation and signal timing calculations are carried out by Origin - Destination movements and Movement Classes. This enables easy modelling of bus priority lanes and signals. Flow proportions and lane blockage dataare used for Lane Movements for network modelling purposes. Gap acceptance parameters adjusted automatically for intersection geometry and control, with option to apply reduction with opposing flow rate. Effect of unequal lane use of opposing (major) stream lanes on capacity. "Percent Opposed by Nearest Lane Only": This parameter allows specification of conditions where some opposed (entering / minor road) traffic gives way / yields to the nearest opposing (major road) traffic lane. Pedestrians at two-way sign-controlled intersections. Improved model of unequal circulating lane flow rates for bunching calculations. Circulating lane flow rates given in the Detailed Output report. "Set as Dominant Lane": This parameter allows user control of how the dominant and subdominant lanes are determined by the program. The change in this parameter results in changes in lane flows, capacities and the resulting performance and level of service estimates. "Include Slip/Bypass Lane in Entry Lane Count": This parameter allows user control of handling of slip / bypass lanes in the SIDRA Standard roundabout capacity model. "Percent Opposed by Nearest Lane Only": This allows specification of conditions where some entry lane traffic gives way / yields to the nearest circulating lane and some traffic using slip / bypass gives way / yields to the nearest exiting lane. Origin-Destination Factor: Allowance made for lane flow balance of lanes on the dominant approach. Bus priority and other special vehicle signals using new Movement Class method. Easier phase sequence data specification. Free Queue: Instead of integer vehicle values, Free Queue Distance values are specified as input. The program converts the distance values to Free Queue values in vehicles as real numbers according to the Movement Classes involved. New features include slip lane crossings, diagonal crossings (for all-pedestrian phases) and more flexible pedestrian staged crossing arrangements (user-specified strip islands can be nominated as staging point). Pedestrian Actuation and Walk Time Extension features for pedestrians at signals. Automatic calculation of Extra Start Loss values for Opposing Pedestrian effects on turning movements at signals. Pedestrian performance equations have been improved (effect of high pedestrian volumes has been included through the use of the flow ratio parameter, and the model for pedestrian movements with two green periods has been improved). Calibration parameters for fuel consumption, emissions and operating cost by Movement Class. Fuel and emission model parameters updated for modern vehicles. Turning Vehicle Effect, Gap Acceptance Factor and Opposing Vehicle Factor parameters by Movement Class and OD movement. Opposing Pedestrian Factor, Opposing Peds (Signals) and Opposing Peds (Unsig) for modelling opposing pedestrian effects at signalised intersections, roundabouts and sign-controlled intersections. Two-way sign control calibration parameters for automatic adjustment of gap-acceptance parameters for intersection geometry, control and flow conditions. Turn on Red gap acceptance model parameters. Additional sensitivity analysis parameters: Queue Space (all Site types), Inscribed Diameter (replaces Island Diameter), Entry Angle and Entry Radius for Roundabouts. Results can be obtained and Graphs facility used for a selected lane, approach or movement (including separate results for individual movement classes) in addition to intersection level analysis. Major user interface improvements (easy Site and Network input and output). All graphical displays including Input Volumes, Demand Flows, Arrival Flows, Phase Sequence, all Movement Displays as well as the relevant output reports are based on Origin - Destination movements, and in some cases Movement Classes. Delay Percentiles table added in the Detailed Output report. Lane Queue Percentiles table includes 100th %ile back of queue as the maximum queue length. Maximum Power adjustment to estimates of acceleration rate (important considering large heavy vehicles in particular). Peak Flow Factors set equal to 100% automatically when Unit time for Volumes = Peak Flow period is specified. Increased number of lanes, movements, signal phases that can be handled.